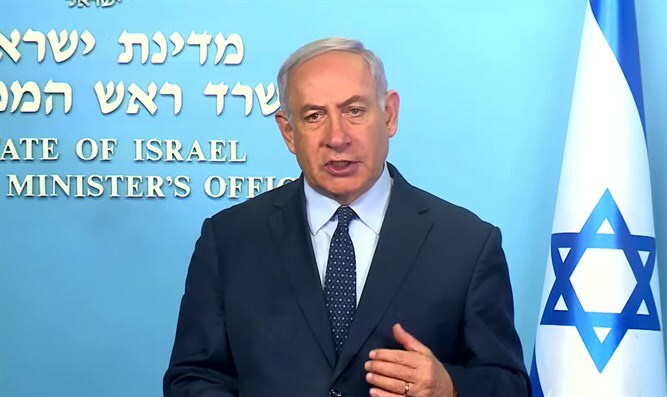 Prime Minister Benjamin Netanyahu Wednesday afternoon referred to the exposure of "the Golan file" by the defense establishment. "This morning Israel exposed a Hezbollah terror network on the Golan Heights. Hezbollah is a terror organization. It's a proxy of Iran. It does Iran's bidding and this terror network is part of Iran's aggression against Israel. "So I have a clear message for Iran and Hezbollah: Israel knows what you are doing, Israel knows where you are doing it. What we have uncovered today is just the tip of the iceberg - we know a lot more," he said. "Israel will continue to do all that's necessary to defend itself," Netanyahu emphasized. "We will continue to use all means - overt and covert - to block Iran's effort to use Syria, Lebanon, and Gaza as forward bases for attacking Israel." The IDF revealed for the first time on Wednesday that Hezbollah has begun an attempt to establish a secret resistance force on the Syrian Golan Heights. Hezbollah, according to the information, has established a terrorist infrastructure called "the Golan file”, which constitutes the establishment of another front against Israel in the next war. The infrastructure includes dozens of operatives and is headed by Abu Hussein Sajid, who joined Hezbollah in 1983 and served in a number of operational positions in southern Lebanon during the IDF presence in the area. During his service, he was imprisoned by the American forces after he led the kidnapping and execution of five American soldiers. This past summer he was sent by the organization to Syria in order to establish Hezbollah's new organization. According to intelligence sources in Israel, the infrastructure was departmentalized so that even the Assad regime in Syria and many elements of the Shiite organization in Lebanon were unaware of its existence. Today, the organization's members concentrate on familiarizing themselves with the Golan Heights and gathering intelligence, in order to operate cells composed of Syrian operatives that would carry out attacks against Israel.